Before Joe Strummer gained international fame with The Clash, he was playing rock and roll standards and rhythm and blues originals with a pub rock group known as The 101ers. Never having released an album proper, The 101ers’ only output was the single “Keys to Your Heart,” which was released a month after their breakup, and Elgin Avenue Breakdown, a compilation of three recording sessions and several live tracks assembled by Strummer five years afterwards. Astralwerks’ Elgin Avenue Breakdown Revisited is a revamped collection of 101ers’ songs extended to twenty tracks from the original’s dozen with previously unreleased material and a detailed history of the band written by one of Strummer’s friends, Allan Jones. Jones relays (among other things) Strummer’s first description of the band: “They don’t have much money, he says, and … they’re not great musicians.” If that last part was ever true, it is thoroughly discredited from the searing guitar solos, soulful arrangements and clean, precise playing displayed throughout the recordings on this album. Elgin Avenue Breakdown Revisited begins with the blistering “Letsagetabitarockin,” a two-minute burst of energy in the vein of Little Richard’s “Tootie Fruitie,” with Strummer spitting out the words like Chuck Berry on “Maybelline” (no wonder a cover of Berry’s classic turns up on the second half of the disc). One can almost sense the punk movement rising up through Strummer’s chugging rhythm guitar; turn up the distortion, simplify the walking bass line, and remove the slick R&B licks of the lead guitar, and the resulting mix would provide the breeding ground for The Clash’s self-titled debut. Although The 101ers never greatly overstepped the bounds of pub rock, the mixture of songs on this album display a certain stylistic depth. With fast-paced numbers like “Motor Boys Motor” and “Sweety of the St. Moritz,” grooving, laid-back songs like “Surf City” or the glistening “Sweet Revenge,” and different shades of songs in between, Strummer shows his flair for writing with a quaint blend of styles early on in his musical career. “Keys to Your Heart,” for example, one of the catchiest songs here (included in two versions), is also one of the most diverse. 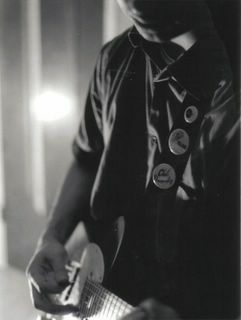 Starting out as straightforward rock and roll, the song slowly progresses into a reggae feel with the help of a bouncy, melodic bass line, plucked guitar that begins to go into off-beats but then reconsiders, and Strummer’s trademark vocals, speak-singing some of the lines and bringing his whole soul into the delivery. Amazingly, as revealed by drummer Richard “snakehips” Dudanski’s liner notes, this is Strummer’s first self-penned song. The second half of the album is a set of live tracks littered with covers, among them Van Morrison’s “Gloria,” the Rolling Stones’ “Out of Time,” and the traditional tune “Junco Partner.” These tracks display Strummer’s burgeoning showmanship with his strong vocal delivery and even a bit of interesting banter. Although they’re not a very good quality, the live tracks will interest both fans of old time rock and roll and The Clash alike (especially considering one of the originals, “Lonely Mother’s Son,” contains the chorus of The Clash’s “Jail Guitar Doors”). Elgin Avenue Breakdown Revisited will most likely be enjoyed by Clash enthusiasts as a welcomed addition to Joe Strummer’s catalog, but those unfamiliar with the group or the man might want to consider picking up London Calling first.